It’ a bird…it’s a plane…it’s a Superlattice! Regular Crystallography 365 readers may remember the perovskite. Since this is a relatively simple crystal structure and can be found with a wide variety of atoms on the cube corners and centers, it’s relatively easy to build “stacks” of alternating layers of different perovskites. When these stacks are layered in a repeated manner, this is called a superlattice. Superlattices are exciting because of the many effects that occur due to the individual properties of the constituent layers and also because of how those layers interact. One of the most well-studies systems has been LaAlO3/SrTiO3. Even though both materials are insulators by themselves, when you alternate them in thin layers superconductivity appears at the interfaces! The example above shows a PbTiO3/SrTiO3 superlattice. 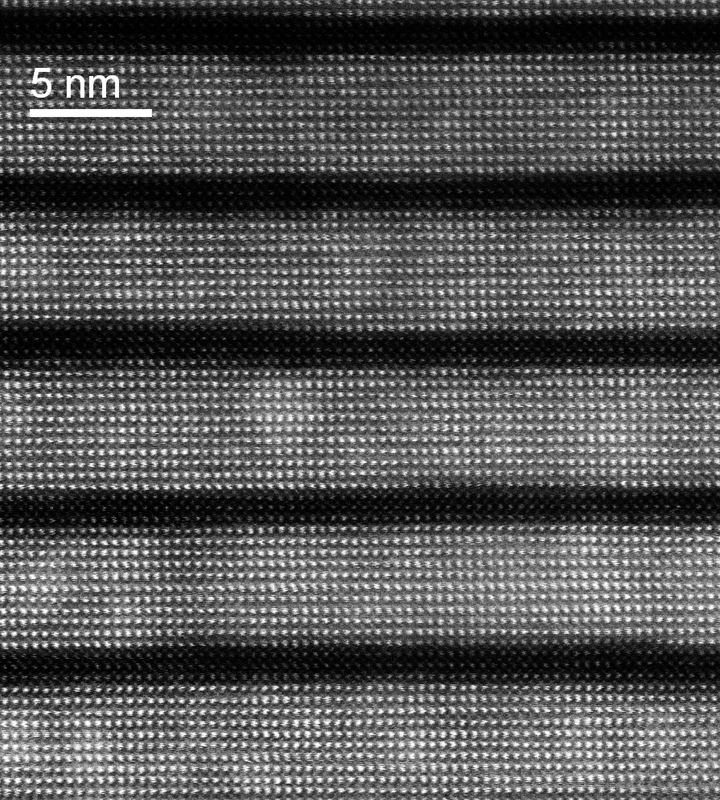 PbTiO3 is a ferroelectric, meaning it has a native electric polarization (this comes from the O and Ti atoms being displaced from the unit cell center – which you can see if you look closely). When you reduce the number of PbTiO3 layers you may expect the superlattice to become less ferroelectric, but competing structural distortions of the individual PbTiO3 and SrTiO3 layers at the interface actually allow the whole system to sustain ferroelectricity even when the sample is made up of mostly non-ferroelectric SrTiO3. Of course, superlattices don’t have to just be made of perovskites. However, because all perovskites share a general form it is easy to alternate thin layers of different materials while ensuring that they maintain good crystal quality. Where did this structure come from? Both the crystal structure and TEM image are PbTiO3/SrTiO3 superlattices. It was made by starting with the SrTiO3 structure (#9006864 in the Crystallography Open Database) and then adding a PbTiO3 layer (#9011192 in the Crystallography Open Database). The in-plane lattice parameters of the PbTiO3 layer were confined to those of the SrTiO3 layer to simulate epitaxial strain. As a result the out-of-plane lattice parameter of the PbTiO3 layer was made larger, which is observed experimentally. 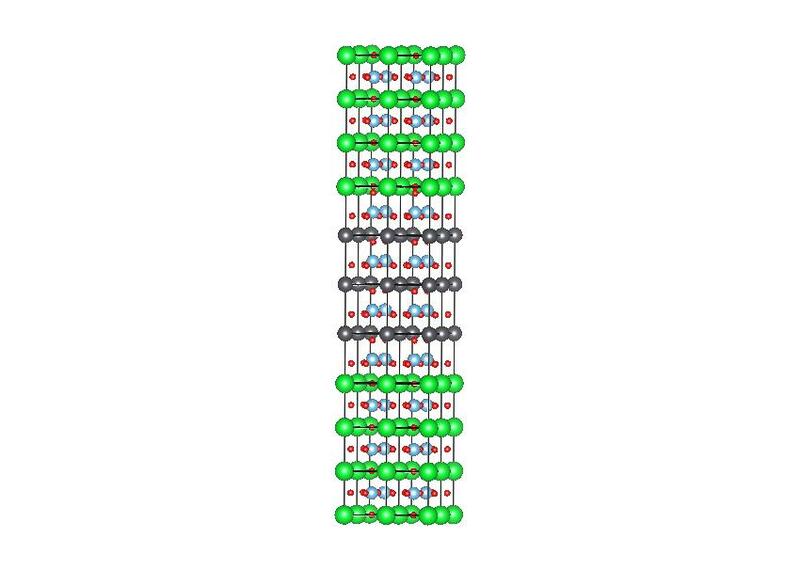 In the SrCoO2.5 structure shown above the green are strontium atoms, the blue atoms are cobalt atoms, and the red are oxygen atoms. Not too long ago, you were introduced to the extremely versatile perovskite structure. In addition to being a widely observed crystal structure itself, the perovskite form can be found as a “building block” in many other types of structures. 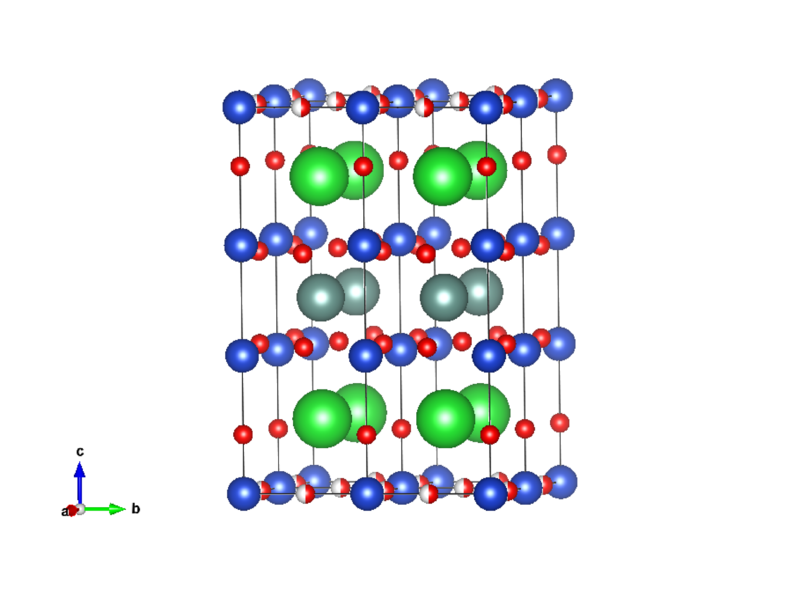 Today’s crystal structure, brownmillerite, has perovskite layers that alternate with layers of oxygen tetrahedra that center on the B atom (here Co), forming a superstructure. Brownmillerite SrCoO2.5 is particularly interesting because of how it forms. SrCoO3 has a classic perovskite material. But cool things happen when you start creating oxygen vacancies within the system. Rather than have the vacancies spread randomly throughout the crystal, which occurs in most materials, they create a new order! (For your fancy vocabulary word of the day – this is called a topotactic phase transformation.) This is the origin of the oxygen tetrahedra, which are made of two fewer oxygen then the octahedral in the perovskite layers. The difference in structure between perovskite SrCoO3 and brownmillerite SrCoO3 has been known for a while, but recent work has shown that the phase transition between the two can be engineered through temperature and environment (see Jeen et al. in Advanced Materials or Nature Materials). While the electrical and magnetic properties of oxygen deficient SrCoOx materials were first thoroughly studied by Hiroshi Wantanabe in 1957 the first structural study on the brownmillerite SrCoO2.5 was reported by Wantanabe, Takayoshi Takeda, and Yasuo Yamaguchi in 1972. In the Yttrium Barium Copper Oxide structure shown above, the teal atoms represent Y, the green are B, the blue atoms are Cu, and the red are O.
Yttrium Barium Copper Oxide (or YBCO) is a high temperature superconductor, much like Lanthanum Barium Copper Oxide. Its claim to fame, however, is that YBCO was the first superconductor with a critical temperature (at which it becomes superconducting) above liquid nitrogen (77 K). This huge leap was made in 1987 and kicked off a period where different high temperature superconductor materials with critical temperatures of up to 140 K were investigated. While this is still well below room temperature, it’s much hotter than the critical temperature of mercury (4.2 K), the first superconductor ever discovered. While the above crystal structure shows YBa2Cu3O7, many other compounds with different Y, Ba, and Cu ratios fall into the YBCO family. Different types of atoms can also be substituted at the Y and Ba sites (e.g. Y1-xPrxBa2Cu3O7), which can alter the properties of the system. High temperature superconducting YBCO was first reported in Physical Review Letters by M.K. Wu et al. in 1987. They reported that Y1.2Ba0.8CuO4 had a superconducting transition between 80 and 93 K.
The above YBa2Cu3O7 structure is #1001452 in the Crystallography Open Database, where many other YBCO compounds can also be found. What looks like a soccer ball but has a lot more in common with a diamond? That would be buckminsterfullerene, the carbon structure shown above. With a chemical formula of C60 and a catchy nickname (the bucky-ball) this carbon structure is made up of twenty hexagons and twelve pentagons, which form a truncated icosahedron. Since buckyballs are empty in the middle, they can be used as “atomic shrink wrap”, where a different atom is placed in the center of the C60 cage, which can then be “shrunk” by laser pulses to trap the atom. 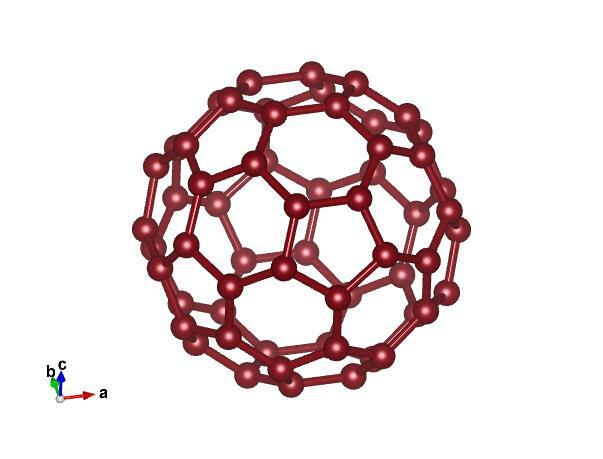 Like graphite, buckminsterfullerene is a sort mater, however, under pressure it transforms into a superhard structure which can even indent diamonds. Buckyballs were first synthesized in the 1980’s by Robert Curl, Harold Kroto, and Richard Smalley. The structure was named after architect Buckminster Fuller, who was well-known for designing geodesic domes. Their work was awarded the 1996 Nobel Prize in Chemistry. The structure is #9011073 on the Crystallography Open Database.